How Can Banks Benefit From Cryptocurrencies and Blockchain Technology? Banks and financial institutions have always been reluctant to comment positively about Bitcoin and blockchain technology. In general, they perceive these disruptive technologies as a threaten. But reality may be slightly different. Indeed, some of the most important banks in the world are working with blockchain technology and benefiting from it. As reported by CoinDesk, the bank’s global head of wealth, Christian Nolting, and the global head of the CIO office, Marcus Muller, explained that cryptocurrencies and blockchain technology can bring huge opportunities to the market. Blockchain will be able to modify the way enterprises and companies work all over the world. Additionally, 10% of the global GDP in 10 years would be regulated of powered by blockchain. Besides that, businesses around the world are very optimistic about the future of Blockchain technology and how it can change the system. The Neustar International Security Council, has revealed that 80% of companies have an interest in using cryptocurrency for transactions. And almost 50% of the respondents commented that cryptocurrencies could generate income to their businesses. Cryptocurrencies and Blockchain could improve banking products and services in a world that is getting more competitive than never before. Financial institutions should adopt to the changes that the world is facing by embracing this promising technology. “We won’t ever go back to whatever we think normal was, to the way things were. The world is not standing still, it’s moving on,” reads Deutsche Bank’s Corporate and Investment Banking webpage. JP Morgan Chase, one of the banks that was attacking Bitcoin since the very beginning, is also benefiting from using Blockchain technology. It has improved several of its products and services and its working in order to not be left behind the new financial trends. 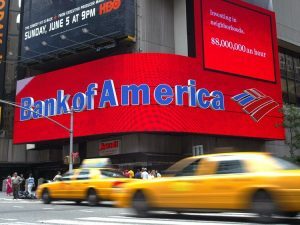 At the same time, Bank of America, has also explained that if they do not invest in blockchain technology to improve their technology, they will not be able to adapt to these new times. Bank of America explains a situation that is happening to most of the banks competing in the market. That’s why is so important for them to understand that the technology should be embraced and developed. If they do not do that, the results may be catastrophic for these institutions. Indeed, JP Morgan has a specific department that works with this technology, the so called Blockchain Center of Excellence (BCOE). The intention of the BCOE is to work with blockchain technology, explore new use cases and pilot solutions across business lines. According to the webpage of the company, the BCOE is accelerating the implementation of Blockchain within JP Morgan, leading a blockchain space with JP Morgan experts and developing in-house products to bring the best solutions to the markets. Banks have discovered a new competitor that is bigger and more powerful than any other bank in existence. But the new international framework can help the most advanced banks to succeed and keep growing. Blockchain and Cryptocurrencies will help banks to offer better products and services, and this is what these institutions are doing.